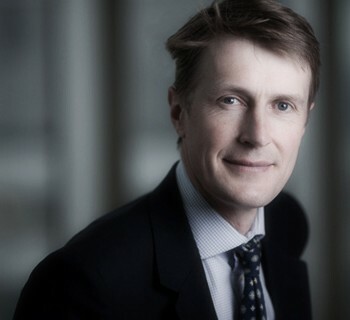 James Henderson is the lead manager on three investment trusts, Law Debenture, Lowland and Henderson Opportunities, with combined assets of more than £1 billion. A UK equity specialist, with the exception of the 2007-09 bear market, his funds have outperformed his peer group for most of his tenure, according to FE Trustnet. I spoke to him on 19th January 2016. I’d like to start by asking you about the current market situation, where you think we are in the investment cycle. You started managing investment trusts in 1990 in a bear market and you’ve lived through five or six nasty bear markets and corrections since then. Do you think that’s what we’re facing now – or is this just another market wobble? I think it’s more of the latter. Usually market cycles end when companies, particularly the industrials, have geared themselves up too far – they become complacent, they’ve put in capital spend that isn’t justified by their sales and they have accumulated debt on their balance sheets. None of that is happening this time. Companies are still generating cash. Corporate debt is low. There hasn’t been a capital spend boom. Every piece of capital spend in recent years by most corporates has had to be justified. Yes, there will be disappointments but that’s a very different environment to an extended upswing that typically leads to over-capacity, debt and recession. So looking at cash generation companies are strong, and I think they can get through a more difficult headwind in the economy and come through the other side. Equity markets are overly concerned about the health of these companies. So from a bottom-up perspective, like mine, I don’t think this is the end of the bull market. I know economists will have their doubts, but my view, talking to companies, is that there’s a robustness there that isn’t being reflected in valuations. So how do you explain what’s been happening in the last couple of weeks? There have been periodic bouts of weakness in the markets since last summer. Well, there is a problem. China has grown strongly. That has helped the global economy. I believe that China is still, in the medium-term, going to grow. Emerging markets are going to keep emerging over time. We will fly more miles in aeroplanes in five years’ time than we do today. There will be more cars on the road driven around. But you don’t necessarily get there in a straight line. There will be these periods when demand slackens, but it’s taking it too far to say this leads to long-term recession and long-term problems. This kind of slowdown happens in economies the whole time. There are cycles going on, and within those cycles, when you’re living through them, they can feel vicious. Markets do over-react. They do predict more recessions than actually happen. Is the corollary that you are finding more attractive opportunities now that prices have come off by 10%? Yes. You’ve got to use these downturns to refresh the portfolio. It is in slowdowns and in difficult times that good companies re-assert the disciplines that will look after them in better times. Companies that are grappling with what they’re really good at, and focusing on that, will be good long-term investments. So yes, I am definitely using this period to buy things that are being treated unfairly, in my view, by the market. As a general rule for many companies things are never as good as you’re told, and they’re rarely as bad as you’re told, and we’re going through one of those periods at the moment where too many, particularly in the industrial area, are unfairly being told that they are poor companies. There’s a bit of a headwind at the moment but it will pass. You wouldn’t be holding such a big overweight position in industrials if you thought that we were heading into a recession because they tend to be cyclical and they tend to be very sensitive to economic growth. How big a position is it and what sort of companies have you got in there? In Lowland for example, we have around a quarter of the portfolio in industrials, which is two and a half times the weighting in the All-Share index. There are companies in there that are doing very different things and are growing strongly. There are companies in there that are being hurt by the turndown in mining because they supply the mining industry. The global economy is growing. America is still growing 2.5+%. The UK is growing at about that too. There is a big infrastructure spend going on, and there are industrial companies that are working and benefiting from that pick-up in spend. The biggest economy by far is still America and when America starts to spend a bit more on its bridges and roads, there are beneficiaries. What about the mining companies? They are cyclical but you’ve been starting to rebuild a position as a contrarian investor. Are you not worried you may have bought in too early to some of these stocks like Glencore and Anglo-American? Yes it has been too early, but, as you say, we are buying in small size. On days when it looks really red and miserable, you buy a bit more. We never feel particularly rushed because it’ll take its time to work its way through, but we are buying well below replacement cost. In the UK companies with really good assets behind them, including Rio-Tinto, Billiton and even Anglo American, are what I’m buying at the moment. Anglo (AAL) is the most controversial. You can almost see the take-in of breath when you walk over with a dealing ticket to the dealers in Anglos at the moment, but De Beers, which is the Anglo group, is a quality asset, and diamond prices will recover somewhere out there. In fact, they will probably recover quicker than iron ore prices, and De Beers will be leading the way in that recovery. Disciplines have been learnt and those disciplines will serve them well in better times. Shareholders will be surprised at the kind of margin that can be achieved on not a great deal of top-line improvement. But what is the argument for buying them now? Is it because, when the cycle does turn up, as it will do quite soon, you’ll then be scrambling to catch up if you haven’t already built some position in those stocks? At the bottom, what happens is that prices become very volatile. So, if you think something is cheap and prices are very volatile, the best thing to do is just buy small amounts on the weakness. You can try to time it, but I’ve never been able to do that because as share prices recover, there will be false dawns, and you’re sucked in on the false dawn, only to be kicked hard when it falls again. It’s much better to lay out your stall and then buy slowly on the weak days. There will be false dawns and it will take longer for some of these companies to recover and some won’t recover. You need a portfolio approach, but the discipline of being a contrarian in value investing is to buy when it’s painful like this and try and control the risk by doing it slowly, doing it without getting sucked in on the pick-up, on the strength. Even if you had a good recovery, you can even sell a few because, again, at the bottom, as I say, you see this marked volatility. In the UK though, as an investment trust which takes great pride in its long history of dividend increases and maintained and increasing dividends, are you not worried, as many seem to be, by the risks to dividends in the UK market, because of its over-exposure to miners and so on which have very high yields and where many people expect them to be cut? I believe a lot of the big companies will cut. With Glencore and the Anglos, there is already no dividend there, but it doesn’t stop you buying because I believe, on a three or four year view, they will return to the dividend list and the prices we are paying today in one or two of them will turn out to be very good prices historically, as the historic yield you’re buying on them is high. The great thing about an investment trust being closed-ended, with a relatively large revenue reserve, is that we can smooth that dividend profile. At the same time, because there’s this mixture of large, medium and small companies, quite a lot of the medium and small companies, we see good dividend growth coming through. It’s really quite ironic: I can predict where dividends are going for the small company portfolio more easily than for the large company portfolio. I never thought I’d say that. As we’ve got a revenue reserve, I think what will refresh the revenue account in three years’ time are some of these zero-yielders coming back onto the list. With the revenue reserve and with the smaller company dividend growth we have got visibility to see the dividend growing for the next few years, and some of these recovery stocks will be kicking in with dividend payments again then. One of the distinctive things about your investment approach is you do have a multi-cap discipline (about a third in large-cap, a third in mid-cap and a third in small-cap, including AIM stocks). Small-cap has been very strong in the last few years, although it had a wobble in 2014. Are you surprised how well it’s done? I think some of that is recovery from pretty over-sold levels after the financial crisis of 2008. What we can see in the numbers is that you’ve got better dividend cover in the small-cap sector. You’ve got better earnings growth coming through there in aggregate, while it’s been some of the big companies that have been the big disappointments. One factor may be that the lifecycle of companies is getting shorter. So companies like Tesco. a blue-chip FTSE-100 company that was liked and respected across the market a few years ago, only for people to question it as the margin has fallen sharply and the management has had to re-invent some of their practices and re-learn some disciplines. I think these things are happening faster, and as a result I think big-cap investing is quite difficult. There are very few companies that you can just hold and forget about because the world keeps changing. Exactly. You can see that on the High Street. Technological change is undermining some business franchises very fast. While you’ve got a significant overweight in industrials, you don’t have much exposure to the banks which are also cyclical. Why is that? Would they not be expected to do reasonably well if we’re into a period of continued growth, as you expect? I think we still don’t know where it ends with the banks. It is still payback period for the excesses which the politicians and the regulator feel they have to put right. The only thing we’re sure about is that the regulator doesn’t want a crisis to happen again, and therefore the bar keeps going up as regards their capital requirements. The payback is coming in other ways too, such as fines, and the fact that the customer doesn’t have a great deal of loyalty to the banks anymore. As franchises, there is still a lot for them to address. We don’t know how much capital they’re going to need. You don’t know what kind of returns on capital they’re going to make. You don’t know what earnings and dividends they’ll pay in time. I hope there is nothing wrong with the banks, not because I’ve got much in the sector, but because if they are okay, it means that the economy is fine, and that other parts of the portfolio will benefit from UK plc strengthening. I don’t feel I need to be there until the uncertainties clear. You don’t have to be everywhere. Just as with the things you’re comfortable with, make them count, but don’t feel you have to be in every company. Can you give us a couple of examples of stocks or sectors where you have been adding recently and where you see the most potential in your portfolio? What sort of things are you getting excited about? Well I’m adding to Rolls Royce (RR.) at the moment. It is a company which is rather like Tesco. At the time the admired and highly thought of CEO left, investors were over-enthused about Rolls Royce. There were difficult bits in the business even then. Now it’s had management change and I think the new management is facing up to some of the problems in the business. At the same time there was an element of truth all along. It is a great company. It’s got wonderful technologies. Its product is globally competitive, alongside General Electric. It is part of the duopoly that supplies the 787. That gives it visibility in its order-book that isn’t being appreciated at the moment. Yes, it’s got questions to answer. It’s got work to do to restore the margin, and these things will take time, but if you start with a really good business that’s growing, it’s a better place to be than not having strong business technologies, so I think actually the recovery will happen quicker than people think. And something in the sort of smaller-cap sector of the portfolio? One stock I have just been buying is Shoe Zone (SHOE, 191p), which came to the market and disappointed six months ago. It is a wonderful cash-generative business, with a management team that’s really focused, that have built the business up themselves. It’s generating a lot of cash. It’s paying a special dividend on top of its ordinary dividend. They really know their business and the ambition is focused on understanding what they’ve got and growing what they’ve got, rather than trying to grow too quick. Instead they are returning cash via special dividends. I think it is going to be a really good compounding story over time. 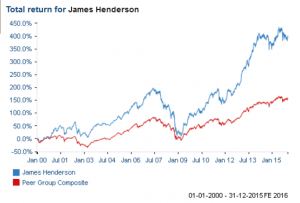 James Henderson has been Director of Global Equity Income at Henderson Global Investors since 2003. 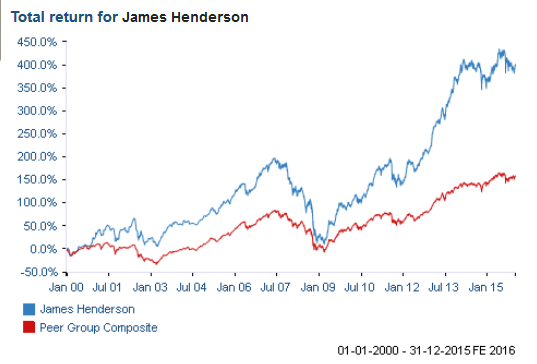 He joined Henderson in 1983 as a trainee fund manager and has been managing investment trusts since 1990. Before joining Henderson he trained as an accountant at Binder Hamlyn, having graduated with an MA (Hons) in Economics from Cambridge University. Henderson Global Investors is a global asset manager with core capabilities in global and European equities, global fixed income, multi-asset and alternatives.